With MAXQDA you can create frequency tables and charts for subcode frequencies. You can open this function in the ribbon menu via Codes > Subcode Statistics. The split “Choice of Codes” dialog box: on the left side, all existing codes that have subcodes are listed; on the right side your selected codes appear. In the middle, arrow buttons allow you to transfer codes from one window to the other. You can also do this by double clicking on a code. Click on the column header of either list in order to alphabetize content. For codes containing subcodes, this function can also be called up directly from the Code System. 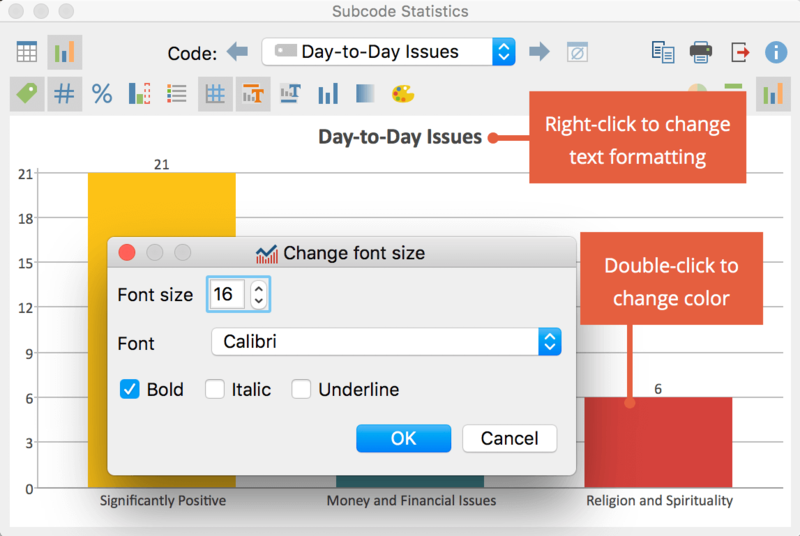 Right-click on the code and select Statistic of subcodes. In this way, you can also access the statistics functions for codes that are not at the top level of the code system. The analysis can be restricted to currently activated documents and subcodes. To do so, check the appropriate boxes. Documents (count all subcodes) – This option corresponds, in principle, to an evaluation of multiple responses. In this case, the analysis is performed assuming that when several subcodes can be coded in a document, the subcodes are not mutually exclusive. MAXQDA analyzes the number of documents to which a subcode has been assigned. All subcodes that occur in a given document will be counted, on a per-document basis. This type of analysis would typically be employed to answer the question “What percentage of cases (= documents) mention the theme (= code) XY ?”. Documents (count most frequent subcode only) – In this case, the analysis is performed under the assumption that subcodes are mutually exclusive, meaning that subcodes can be interpreted as categorical variables. MAXQDA analyzes the number of documents to which the subcode has been assigned. On a per-document basis, only the subcode that occurs most frequently is counted. If two or more subcodes occur with the same frequency within a document, a new “not defined” category will appear. Coded segments – This option analyzes the number of coded segments per subcode. Please note: Regardless of which unit of analysis is selected, not only the direct subcodes of the selected parent codes, but also the subcodes of subcodes, will be included in the analysis. All lower-level codes will be aggregated with the top-level code, and only this code will be displayed in the results table. Once you click OK, MAXQDA begins the statistical calculation, after which the results will be displayed as frequency tables and diagrams. The first column of the table lists the different subcodes of the table; the second column, the absolute frequency; the third column, the corresponding percentages. The fourth column shows the percentages based on valid values, meaning documents without analysed codes are not taken into account. If there are no missing values, then the percentages will be identical in the third and fourth columns. Tip: Click on the column headers of the first two columns in order to define row order. For example, you can sort in descending or ascending order of category frequency. Unit of Analysis: Document (count all subcodes) – The table will show the number of documents in which the respective subcode was assigned. For each document, all subcodes that occur in the document will be counted. At the end of the table, the number of documents is displayed in which none of the analysed subcodes occur. Unit of Analysis: Document (count most frequent subcode only) – The table will show the number of documents in which the respective subcode was assigned. Subcodes are mutually exclusive. For each document, only the most frequently occurring subcode will be counted. At the end of the table, the number of documents is displayed in which none of the analysed subcodes occur. Unit of Analysis: Coded Segments – The table will show how often a subcode was assigned, meaning how many coded segments exist for this code. Example: We are analyzing how the code “people” was assigned in 7 interviews in a MAXQDA project. The code has the subcodes “Partner”, “Siblings”, “Parents”, and “Friends”. If we create a Subcode Statistics table with the unit of analysis “Coded Segments” the result table lists how often each of the subcodes was used across all of the 7 interviews. See below how many of the total 40 coded segments fall into which subcode. 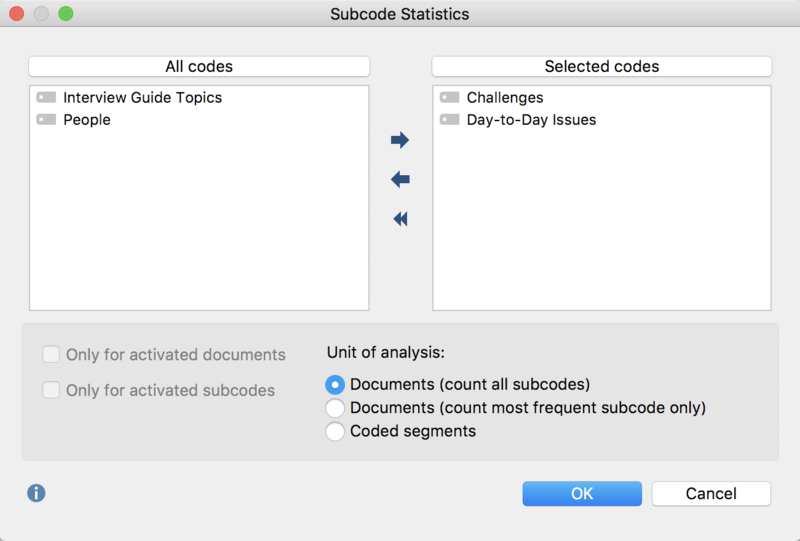 If you instead select the unit of analysis “Document (count most frequent subcode only)” a new column “Percentage (valid)” is displayed. As you can see below 5 of the analyzed documents don’t have any of the subcodes in question assigned to them. The last column calculates the percentages based only on the 5 documents with any of the selected subcodes. The first line tell us, that in two documents the subcode “Partner” is the most frequently assigned subcode. For another two document the subcode “Siblings” is the most frequent subcode and in one document “Parents” is the most frequently assigned subcode. If you select the option “Document (count all subocdes)”, MAXQDA counts for each subcode, in how many of the documents it occurs. Once again you can see that only five of the documents have any of the subcodes assigned to them. The subcode “Parents” occurs in five documents, the subcode “Partner” occurs in three documents, and so on. 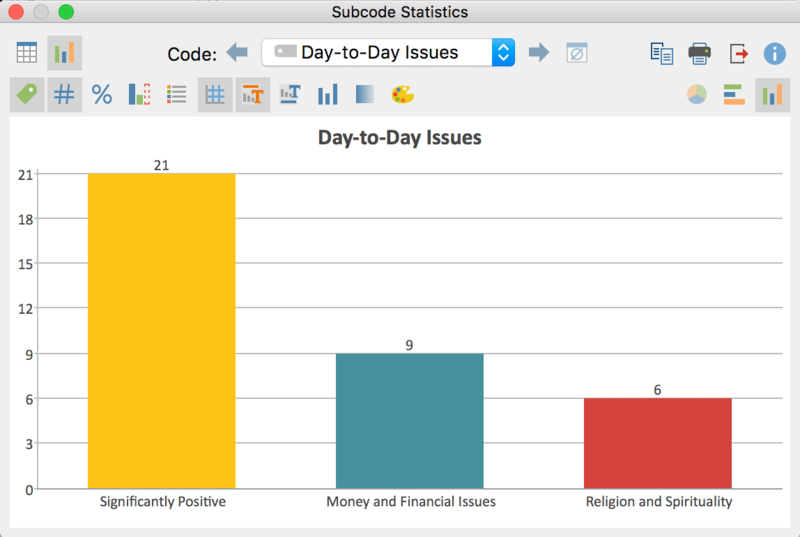 The percentage columns shows how large the percentage of documents with the subcode in question is. Subocde “A” Number of documents in which Code “A” occurs. Subcode “B” Number of documents in which Code “B” occurs. Subcode “C” Number of documents in which Code “C” occurs. DOCUMENTS with code(s) Number of documents in which at AT LEAST ONE of the analyzed subcodes occurs. DOCUMENTS without code(s) Number of documents in which NONE of the analyzed subcodes occurs. ANALYZED DOCUMENTS Number of documents total. export results as an Excel file or as a Website in HTML format. Once you have switched to the Chart view by clicking on the icon, a bar chart of the selected subcode appears in the place of the table view. Please note: The order of columns, bars and segments is determined by row order in the frequency table. You will see two toolbars at the top of this window. The upper toolbar is the same as the frequency table, and you can switch at any time to the table view. On the right side of the toolbar you will see three buttons, with which you can choose between pie chart, horizontal and vertical bar chart. The chart can be customized using the options in the lower toolbar. Display labels – shows categorical labels of bar and pie charts on the x-axis. Display data values – shows the data label, meaning frequency of variable values or subcodes. Display percentages – shows relative, rather than absolute frequencies. Display missing values – shows missing values category. Display legend – shows the legend, which is switched “off” by default in bar charts. Display scale – shows the scale axis in bar charts. Display title – shows diagram title. Display text – shows textual description of diagram. One color – use the same color for all pie or bar chart segments. Change color scheme – opens window for color scheme selection. When creating charts, MAXQDA sets an initial color scheme. To customize your charts, double-click on the selected segment and choose your desired color. Click on the Change color scheme button to select from among three preset color schemes. Double-click on the title or description to customize content. Formatting, such as font, font size and font style, can be changed via the dialog window that appears when you right-click on the title, description or another label. Please note: When window size is modified, font size will be automatically modified accordingly. Like frequency tables, charts can be printed and exported. Charts will be exported in PNG format, or as vector graphics in SVG format. In Windows, the vector format EMF is also available, which can be enlarged without quality loss and can be easily imported into Microsoft Office programs.